Outside of Angkor Wat and exploring temples in general, visiting a Tonle Sap floating village has become one of the most popular tourist attractions in Cambodia. I mean who wouldn’t want to take a boat ride on the lake where you get to see an entire village, houses, schools, markets, everything that are literally anchored in the middle of the water?! I know we did. Honestly, I didn’t really know much about the Tonle Sap Lake before we went to Siem Reap, other than that it looked really big on the map. As it turns out, the Tonle Sap is huge! It’s actually the largest lake in Southeast Asia and one of Cambodia’s most important landmarks. The Tonle Sap is home to around 1.2 million people who make their living by fishing in and around the lake. And those fisheries, they make up 16% of Cambodia’s GDP (gross domestic product). The lake was formed as a result of a depression caused by the collision of the Indian and Eurasian plates. When the plates collided, it created a low lying area for the neighboring Mekong River to fill up. As a result, the lake changes in size dramatically in coincidence with the flow of the Mekong River. During peak dry season, the lake covers an area of 2500 square kilometers and has a length of 160 km. During this time the Tonle Sap river, which connects the lake with the larger Mekong River, flows south, and water drains from the lake into the lower Mekong River and towards the ocean. During peak wet season in August, the lake swells to an area around 16,000 square kilometers and grows to be 250 km long. All of this growth is due to the monsoon rains that pound Cambodia every summer. When the rain comes, the Mekong River rises and flood waters are pushed up into the Tonle Sap filling the lake and low lying areas around it. This causes the Tonle Sap river to reverse directions and flow north into the lake instead of south into the ocean. The Tonle Sap lake is a major source of food for the Cambodia people. Many Cambodian families have made their living for generations by living and fishing in floating and stilted villages on the Tonle Sap. Surprisingly, most of the villagers here are actually ethnic Vietnamese who’s ancestors immigrated to Cambodia 3-4 generations ago. While it may be cool or interesting for us to tour these villages and observe the local way of life, unfortunately, the locals don’t reap any benefits from our presence, often living a life of severe poverty. Why Are There Vietnamese Villages On The Tonle Sap? Cambodia’s Vietnamese immigrants lived a much better life many years ago. Then the Khmer Rouge happened. The Khmer Rouge ruined many lives in Cambodia, but they left a particularly deep scar on the country’s immigrant and minority population. Most of the Vietnamese population in Cambodia was deported back to Vietnam during the Khmer Rouge’s reign. The people lived for months in refugee camps on the Cambodia/Vietnam border before being officially taken back into Vietnam. 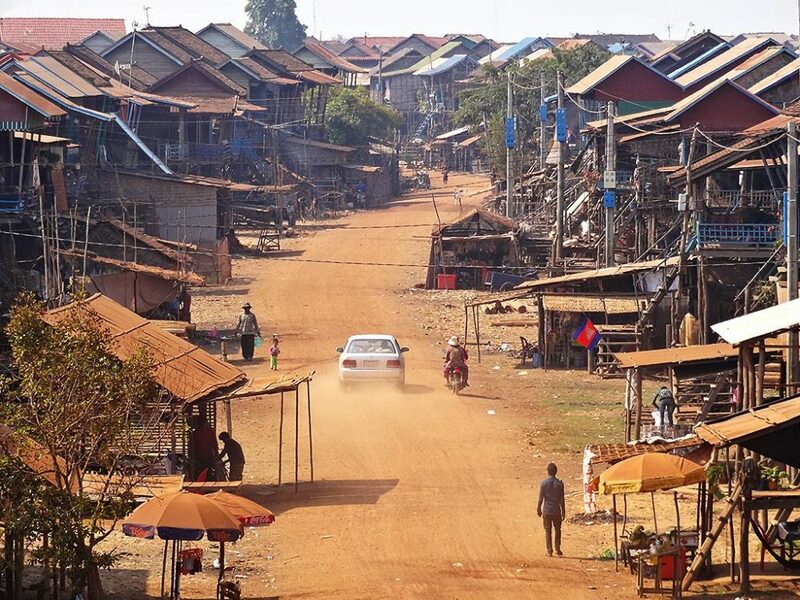 During this time, hundreds of thousands of people were displaced and their villages destroyed, destroying with it all proof they once had of Cambodian citizenship. Despite having their land occupied by people who considered them unwelcome guests, most of the Vietnamese Cambodians decided to return to Cambodia after the fall of the Khmer Rouge in 1979. 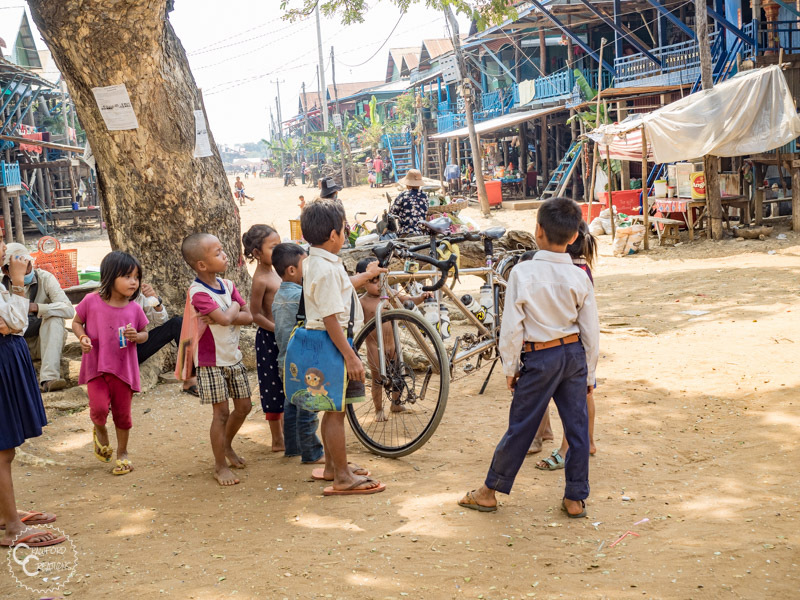 While the villagers are indeed ethnically Vietnamese, they feel just as Cambodian as any other local. Most of these people had been born and raised in Cambodia, and all they wanted to do was return to their homes. Unfortunately, they now have no ID cards or paperwork of any kind to prove they had been born in Cambodia and are indeed a Cambodian citizen. In accordance with Cambodian law, with no proof of citizenship, these villagers are not allowed to own any land. While the law is very clear about the restriction of land ownership to Cambodian citizens, it says nothing about the water. Since the ethnic Vietnamese weren’t welcome on land, if they wanted to stay in Cambodia their only other option was to take to the water. 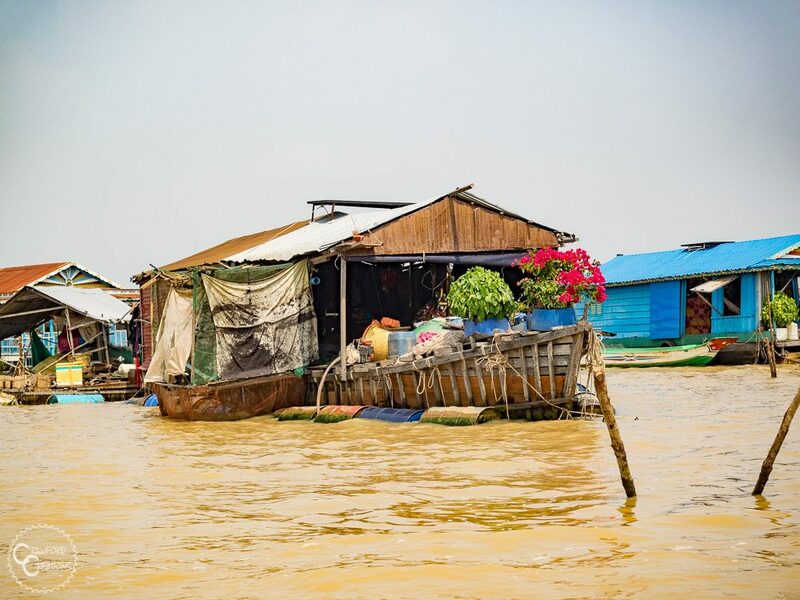 As the largest body of water in Southeast Asia, most of the Vietnamese Cambodian villagers ended up settling in floating villages on the Tonle Sap. But finding a house wasn’t their only problem. Not having proof of citizenship also prevents them from getting any sort of decent job, opening a bank account, and even prevents their ability to send their kids to school. As a result, they survive by fishing on the lake. But even that has its challenges. Without proof of Cambodian citizenship, the villagers are forced to pay arbitrary taxes in order to fish on the lake. To avoid this, a lot of families have set up small fish farms outside of their houses to raise food for their family without having to pay insane fees. Any extra fish they have are bartered for rice and vegetables on land. Unfortunately for the Tonle Sap villagers, progress in Cambodian law and cultural sentiment has been painstakingly slow. While the ethnic Vietnamese just want to live a better life and be able to stay with their ancestors, the general Cambodian population is very wary of granting them citizenship rights. Tensions are still high between Cambodia and Vietnam over the Vietnam takeover of Southern Cambodia in the 18th century which was made possible due to a disproportionately high population of Vietnamese immigrants in Southern Cambodia. The area around what we know now as the Vietnamese city of Saigon was actually historically part of Cambodia. Despite the fact that all this happened over a century ago, Cambodians are still wary of history repeating itself. Unfortunately, the majority of tourism on the Tonle Sap doesn’t benefit the locals at all. 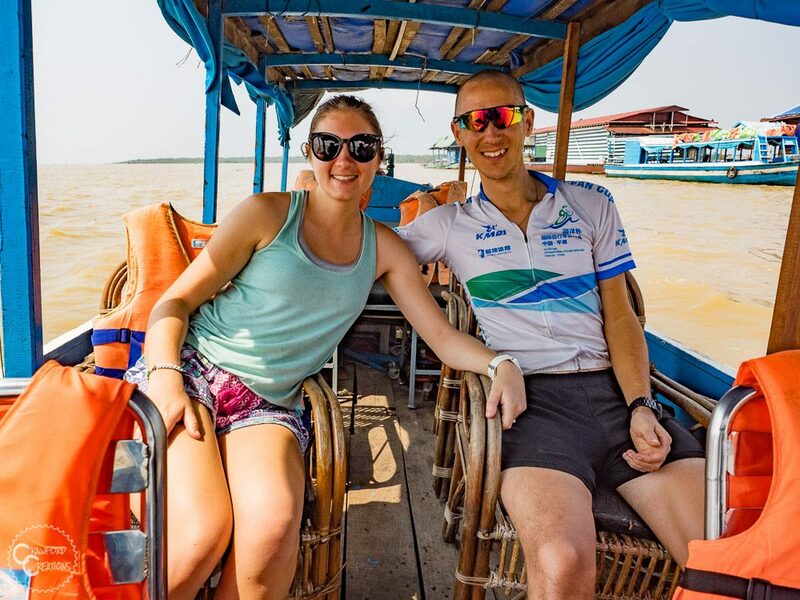 All of the Tonle Sap tours are run by outside companies, and a lot of them don’t employ or donate any money to the local communities they’re bringing tourists to. Tour boat companies simply saw a business opportunity and ran with it. And it’s a cool thing, being able to see what life is like in these lakeside villages. I mean who wouldn’t find riding on a boat to see a floating village interesting? I know we did. 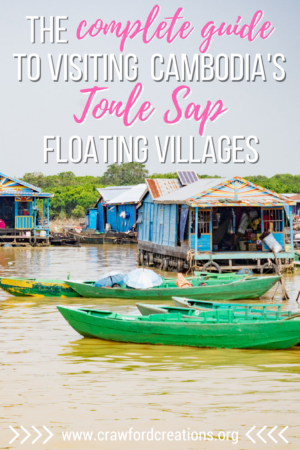 This doesn’t necessarily mean you shouldn’t visit, just don’t think you’re making some saintly donation by paying for a tour around the floating villages on the Tonle Sap. It’s always best to know what you’re getting yourself into. 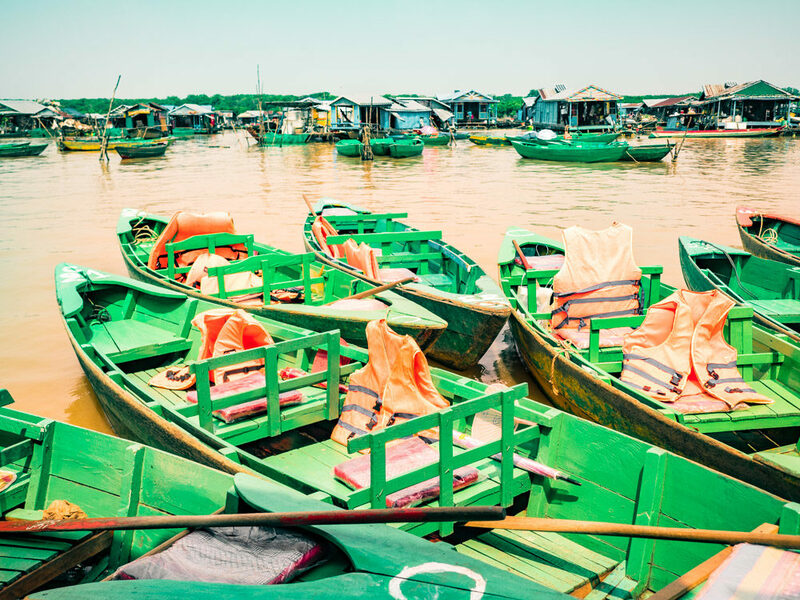 There are four main villages open to tourism on the Tonle Sap lake, each of varying ranges of convenience to get to from Siem Reap: Chong Kneas, Kampong Phluk, Mechrey, and Kampong Khleang. Chong Kneas is the most famous floating village to visit from Siem Reap. Probably because it’s also the closest at 15 km south of the city. This also means it’s the most touristed of all the villages. Chong Kneas moves around somewhat based on the season and water level of the lake. During the dry season, when we visited, all the buildings were anchored at the edge of the lake butting up to the mangrove forest. Chong Kneas is made up entirely of ethnic Vietnamese people, as evidenced by their floating church (Cambodian’s are Buddhist). It was actually really interesting seeing how they created an entire village on the water. All the buildings are basically just giant rafts with walls and roofs. The buildings all have tires on the sides to protect them from banging into things, just like boats, but mostly the buildings are anchored in place on the water so they won’t actually float into each other. When you step into one, you can feel the building swaying gently beneath you, which takes a bit of getting used to. It’s basically like living in a village of houseboats. I can imagine it takes them a few minutes to find their land legs anytime they leave the village. There are two ways to visit Chong Kneas floating village. 1. Arrive at the dock and pay $20 per person for a private boat and guide to take you to Chong Kneas. 2. Book a tour through a reputable company such as Tara Boat and pay $29 for a group tour, lunch included. Option 1 gives you 1.5 hours on the lake, a private, but very loud boat, and a guide. It also subjects you to tourist scams perpetrated by the guides/boat company. The biggest scam to watch out for is buying rice for the children. It sounds innocent enough when they ask if you would like to buy a 50 kg bag of rice for $50 (US dollars) to feed the children at school for 1 day, although honestly, they don’t ask so much as try to guilt you into it, but in reality it’s just a scam. That bag of rice literally never gets opened. What happens is you buy the rice, the seller “gives” the rice to the school, and then the school sells the rice right back to the seller and pockets the money, which may or may not actually go to helping the kids. Don’t fall for it. Plus, we picked up the bag and it certainly didn’t feel like it weighed 50 kg. If you want to donate to help the village, the best way to do so is by purchasing food or souvenirs at the restaurant. We tried some of their crocodile jerky while we were there for $5 a plate. It was surprisingly good! Option 2 gives you 3 hours on the lake, a reputable guide who won’t try to scam you, and a nice lunch. We chose option 1, mostly because we didn’t plan ahead enough to book a tour and they were all sold out on the day we had available to go. Besides feeling a bit like an ATM I was actually pretty impressed with our experience. Full disclosure, after reading some articles about tourism in Chong Kneas, I went into this trip with pretty low expectations. Our guide spoke good English, he was very informative, and generally pretty nice, besides making us feel bad about not buying rice for the kids and guilting us into tipping both him and the boat driver (we feel like the guides might get kickbacks based on how disappointed he was when we didn’t buy anything). Kampong Phluk is a bit further away from Siem Reap at 30 km and is actually a stilted village rather than a floating one. 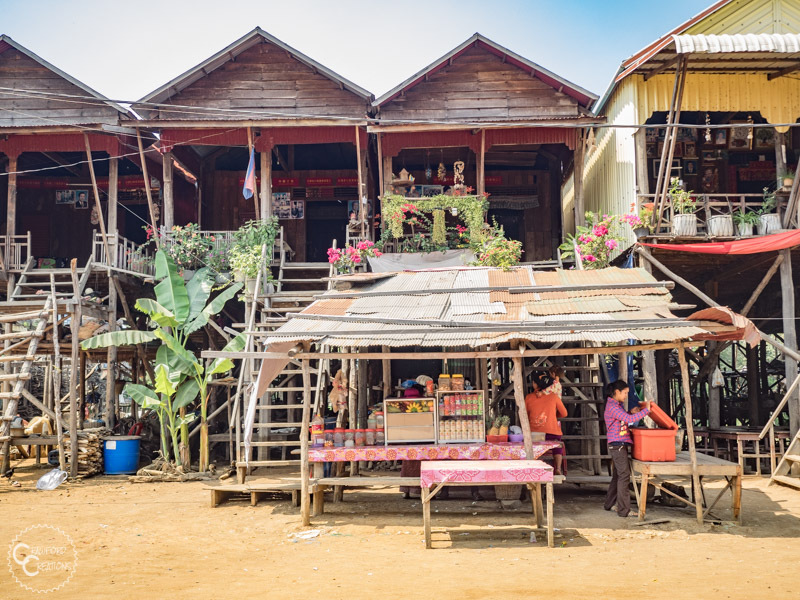 The area is made up of 3 neighborhoods all built on 10 meter high stilts along the banks of a creek that flows into the Tonle Sap. During the wet season (May – October) the water rises up to the bottom of the houses making them appear floating. When we went during the dry season (November – April) you can actually walk or ride a bike down the dirt roads through the neighborhoods. Cost during the dry season is just $5 per person, while during the wet season you have to pay $20 per person to take a boat. In the dry season, a visit to Kampong Phluk can be completely DIY. Just arrange your own transportation from Siem Reap via bicycle, tuk-tuk, or scooter, show up, and walk around the village. To visit in the wet season you can either show up and hire a boat on location or book a tour through Tara Boat. The locals in Kampong Phluk work in the dry season farming crops and in the wet season catching fish and shrimp. Kampong Phluk is surrounded by flooded mangrove forests which you can take a small boat through with a guide if you want to. There are two main streets you can walk down that are each lined on either side with stilted houses. Kampong Phluk is a working village and, like Chong Kneas, they don’t reap much of any benefits from tourists. This is both really interesting and a bit weird as a tourist. It’s cool to just observe the daily lives of the locals here, who live so differently than any village we had ever seen. The locals here seemed genuinely happy compared to what we saw in Chong Kneas, and there weren’t any beggars or tourist scams going on which made the experience much nicer. However, it weirded us out a little bit as it was almost like these villages are treated like zoos in the tourism industry. The locals now live their daily lives getting stared at and photographed by tourists. I don’t know about you but that would get really old for me if I was them. I tried to be as discrete and noninvasive as possible when walking around and taking photographs. We were lucky in the sense that I felt like we were able to bring some joy to the children and give a little bit back while we were there through, of all things, our tandem bicycle that we rode through the village. The kids were honestly just as much, if not more, interested in our bike as we were in their village. They inspected and played with it to their heart’s content while we were walking around. Justin even convinced one of the kids to get on the back and go for a ride through the neighborhood. He couldn’t reach the pedals, but the smile on his face said that didn’t matter one bit! 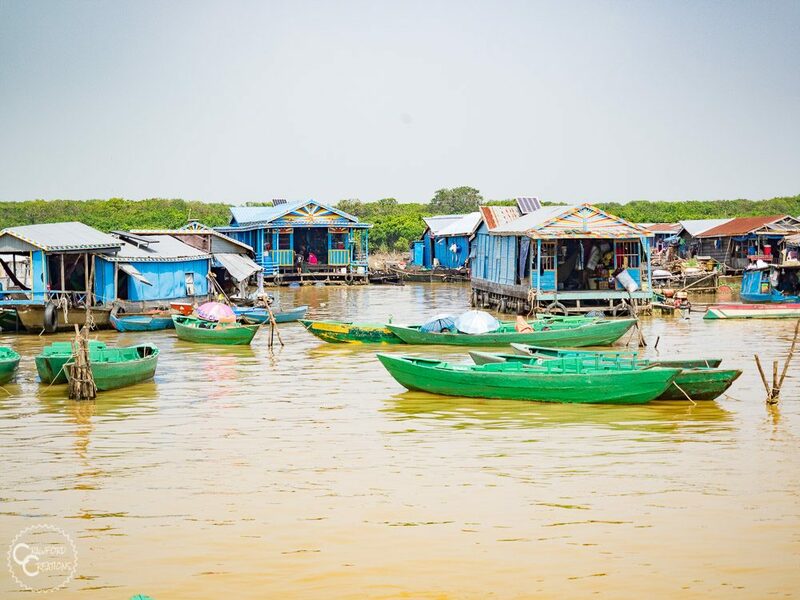 Mechrey is another floating village located 30 km southwest of Siem Reap near the Prek Toal Bird Reserve. Mechrey is the newest of the four villages to the tourist scene, and has unfortunately copied some of the tourist scams popularized at Chong Kneas. The guides here will once again try to get you to buy rice to feed the kids at school. Don’t do it. The rice will not go to the children. The major difference between Mechrey and Chong Kneas, however, is that at Mechrey there is a reputable organization for tourists to donate money to that will actually help the villagers. 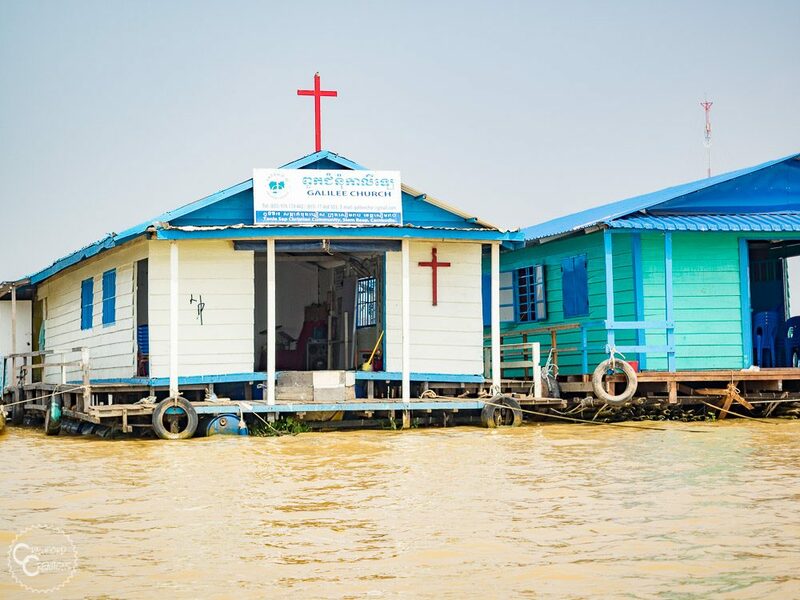 The organization is called The Lake Clinic and they work to provide medical services to the communities living on the Tonle Sap. Another major difference is that being relatively new to the tourist scene, and being located further away from Siem Reap, Mechrey doesn’t get nearly the tourist volume that Chong Kneas does. You can feel good about visiting Mechrey knowing that if you book through the local tour company, Prek Toal Tours, your money will actually be reinvested in the local community. Prek Toal Tours is run by a Prek Toal local who hires other villagers to run his company and then reinvests the profits into the Tonle Sap community by creating non profits such as Prek Toal Community Healthcare and Prek Toal Home and Life’s Project, both of which work to improve living conditions and quality of life for the local villagers. 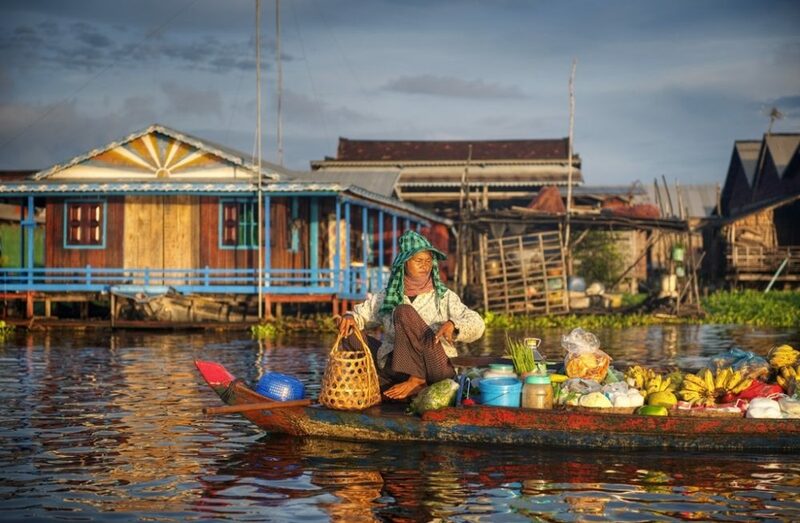 A visit to Mechrey floating village through Prek Toal Tours will set you back $45 per person including transportation to and from the village, a boat, an English speaking guide, and two hours on the lake. At 50 kilometers away from Siem Reap, Kampong Khleang is definitely the furthest Tonle Sap village away from Siem Reap you can reasonably do a day trip to. Kampong Khleang is unique in that it is both a stilted and floating village, so if you’re looking to see stilted and floating villages in one spot, Kampong Khleang is where you want to be. Being further away from Siem Reap also means there will be even less tourists at Kampong Khleang than there are at the other villages, always a plus. Kampong Khleang is also the largest of all the villages, housing around 6000 people! The floating houses move along the lake in accordance with the water level, but during the dry season they’re always anchored right along the bank of the lake. There’s a pretty large class divide between the people living in floating houses and those in the stilted ones. Like Chong Kneas, the villagers living in floating houses on the lake are those of Vietnamese descent who are not allowed to own land. These people are basically discriminated against because they can’t prove their Cambodian birth and have no ID cards. Because of this, their living standards are significantly lower than the villagers living in stilted houses who are allowed to own land and farm to supplement their income during the dry season. Similar to Mechrey, the boat service here is owned and run by locals, so, when you visit Kampong Khleang, you can do so knowing your money is going towards helping the local community. You don’t have to book with a tour company to visit Kampong Khleang. Just show up and hire a boat when you get there. This is best if, like us, you enjoy flexibility in your travels. 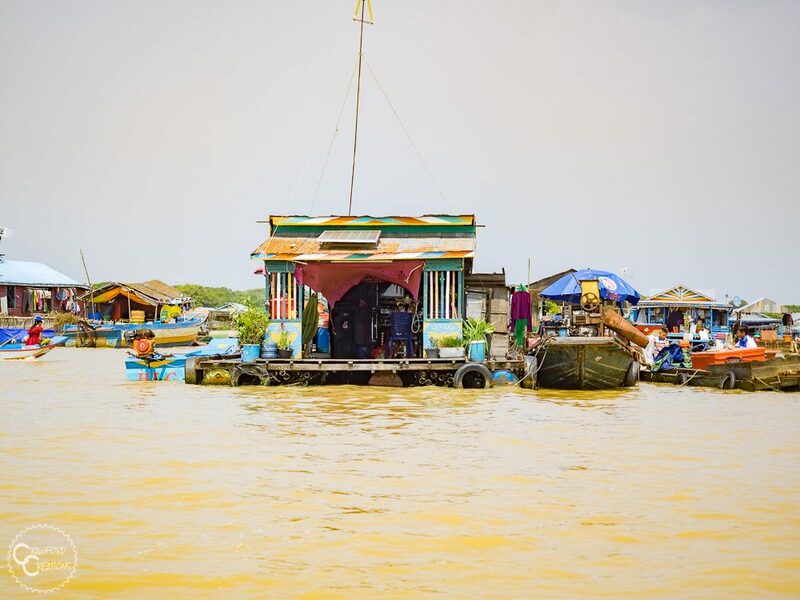 There is no entrance fee to walk around the village, but a boat trip to see the floating houses (and stilted houses during the wet season) will, like every other village, set you back $20 per person. To visit Kampong Khleang you can either arrive and rent a boat/walk around on location or book a tour through Beyond Unique Escapes, Triple A Adventures, or Tara Boat. What Is The Best Tonle Sap Village To Visit? Kampong Khleang is the best village in terms of responsible tourism as well as having both floating and stilted houses in the same place. It’s also the largest of all the villages which means there’s more to see in one place than at the other villages. Pretty much the only downside to visiting Kampong Khleang is its distance from Siem Reap. This is the main reason we didn’t make the trip since we only had a bicycle as transportation. Looks amazing, would be a true experience. Definitely not something I’d usually do, though something I definitely SHOULD do. I’ll take your recommendation and put Kampong Khleang on my must visit list. This is an excellent summary of floating village and Tonle Sap communities. Very detailed and helpful for tourists. I really love how you also discussed the ethnic Vietnamese population living on the lake, their plight, and tensions between ethnic-Vietnamese and Khmer populations. I think this is something that is overlooked but important for us to understand. I just wanted to mention that not “All” of the Tonle Sap tours are run by outside companies. There are several not-for-profit tour companies that employ people from the village and reinvest profits in educational programming, training program, and conservation. These include Prek Toal Tours (which you mentioned), Community First: Kompong Khleang Floating Village Tours (www.kompongkhleang.org) and Osmose (www.osmosetonlesap.net) amongst others. Thanks again for a great read and sharing your experience on the Lake.